I would just like to note that it’s breads like these that make me wish it was sunny all the time. I understand nighttime is of supreme importance as well, but when I have a bread recipe that spans over a 24-hour period, is it too much to ask for a little sunshine from, oh, 8 a.m. to about 4 p.m.? Please? With that said, I humbly apologize for the erratic lighting in these photos, as at one point it was nighttime, the next a very dismal, rainy morning, and finally (FINALLY) a sunny afternoon. Nevertheless, the end result of this particular journey was delectable — buttery, dense, soft, crusty-crust good. And I suppose that’s all that truly matters. I found this recipe in the February 2010 issue of “Vegetarian Times” that my husband, Elliott, snagged on a recent stealth operation to the library. I say this because, you see, he has taken to the library quite well, and since his discovery of the building which houses books for borrowing, he acts as if he’s never read a book in his life. He will leave the house, and return hours later with dozens of magazines, movies and novels of all shapes, sizes and topics and, like a child in a candy store, will devour them all within several days. He’s a nerd like that (a very lovable nerd, of course). Sometimes I benefit from his love of reading, like in this instance when I happened upon an article for “No-Knead Breads.” (OK, I’m not going to lie, he found it first and told me about it — but let not that undermine my excitement!) 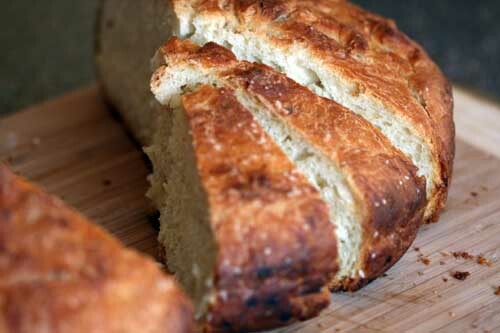 I was wowed by the statement that no-knead breads existed well before breads requiring kneading did. It wasn’t until bakers noticed that toying with the dough sped up the process of gluten development (and, therefore, the finished product) that kneading came into the bread baking world. But enough about that — if you want to know more, read about it here. Unfortunately, what this bread saves in kneading it makes up for in stirring — it’s no picnic stirring a very sticky, stubborn dough. It does save your hands from getting messy, though, and there are no fancy steps to making this bread in any part of the process. You don’t even have to shape the loaf, as the pot does it for you — just plop in the dough, shake it around a bit, top with salt and a carved-out X, and let it bake for an hour. The hardest part of the recipe, apart from the muscle-building stirring, was finding powdered buttermilk. I substituted nonfat dry milk I already had in my cabinet, and as far as I could taste, the bread wasn’t lacking for not having buttermilk. There’s butter in the recipe anyway, right? All in all, this hefty loaf was a crowd-pleaser, with a tough crust and a soft interior and, so says my mother, it’s delicious with balsamic vinegar oil. Whatever that is. Debrief: Maybe next time I’ll make more of an effort to find powdered buttermilk, just to see if there really is a difference in taste. And a smaller Dutch oven than the one I used makes a taller loaf if that’s your thing, but for me, the bread’s taste is all that I really care about. 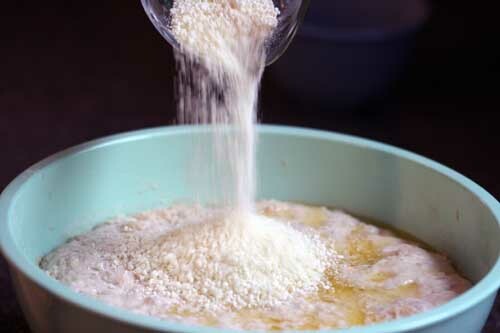 Vigorously stir powdered buttermilk and melted butter into dough, scraping down bowl sides. 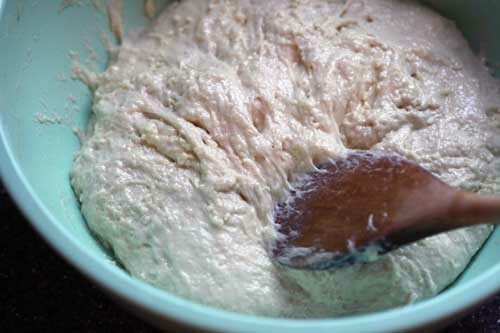 Stir in remaining 1/2 cup flour, plus more as necessary to yield stiff but still stirrable dough. Lift and fold dough toward center with spatula. Brush dough with vegetable oil, and cover with plastic wrap oiled on side facing dough. Let dough rise 1 1/4 to 2 1/2 hours at room temperature (second rise). 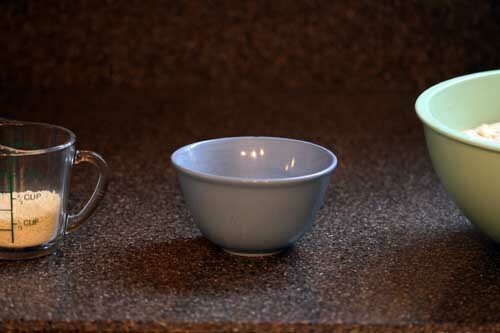 Second rise alternatives: let dough stand in turned-off microwave with 1 cup boiling water 45 minutes to 1 1/2 hours for accelerated rise; for extended rise, refrigerate up to 24 hours, then set out at room temperature. Place oven rack in lower third of oven, and preheat oven to 450 degrees F. Brush 4-qt. Dutch oven with oil, set on oven rack, and heat until sizzling hot. Transfer dough to Dutch oven. 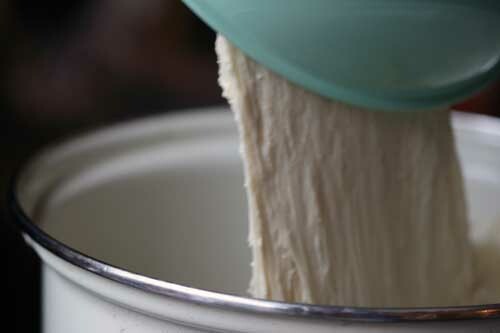 (Don’t worry if dough is lopsided and ragged-looking; it will even out during baking.) Brush top of dough with water, then sprinkle with coarse salt, if using. Slash large X in top of dough with knife or kitchen shears; cover pot, and shake to center dough. 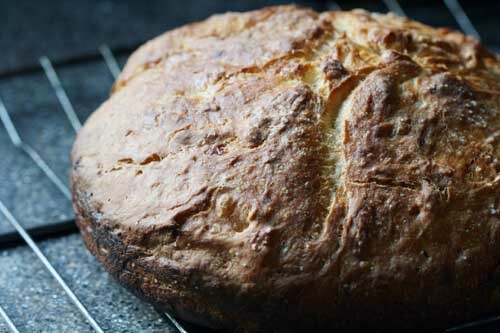 Lower oven temperature to 425 degrees F. Bake bread 50 to 55 minutes. If loaf is browned, leave lid on; if not, remove lid. Bake 10 to 15 minutes more, or until skewer inserted in thickest part of loaf comes out with just a few particles. Bake 5 to 10 minutes more. Cool 15 minutes in pan; unmold, and cool on wire rack. 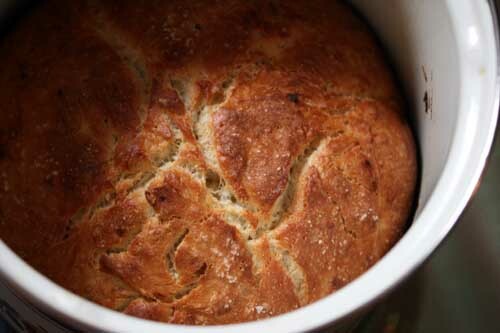 Extra punches: According to the article, err on the side of overbaking with no-knead breads, as you want to ensure the inside is fully baked (especially with a tall loaf like this one). Mmm I’ve just started experimenting with different breads- I’ll definitely check back for some pointers! Your pictures are fantastic by the way! Heather — thanks for the comment! 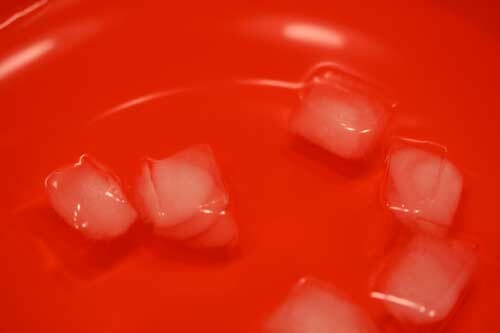 I checked out your blog and some of the foods you made look delicious! Thanks for visiting my site; I’ll be sure to check up on yours, too. Handsome loaf. Will bake this one next. Thanks. I saw this in Vegetarian Times too. Can’t wait to give it a try! Looks delish! wow, this looks very good. Bookmarking it for the next time I’m making bread!